Proudly encamped on a naturally defensive site, the seductive village of Tourrettes sur Loup forms a remarkable medieval ensemble. 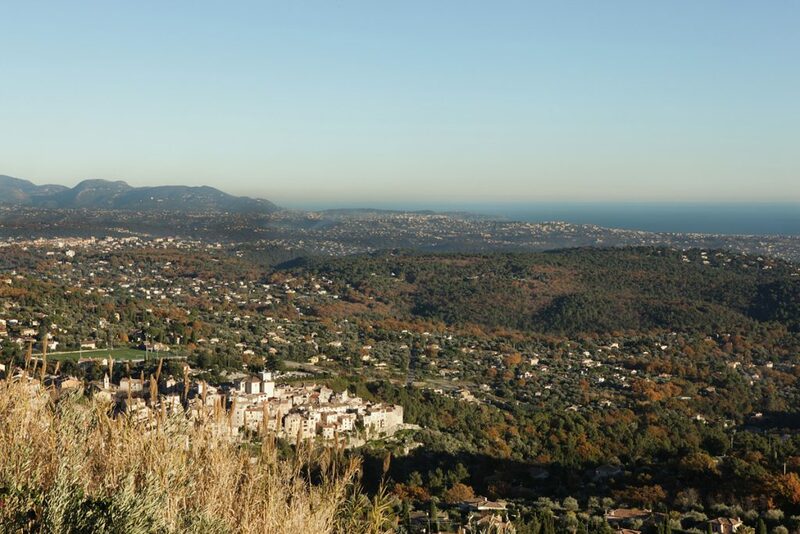 Located in the hills between Vence and Grasse, a short 14 kilometers from the Mediterranean sea, the fortified village is known for its cultivation of violets and for its thriving artist community. The rich historical past of Tourrettes-sur-Loup is inextricably tied to that of the region of Provence and dates back to the 9th century B.C. when it was settled by Ligurian Celtics. Later, from 292 B.C. to 476 A.D., the Romans came to occupy the ‘turres altea’ – higher grounds. For the next 500 years, Tourrettes was invaded by various barbarian tribes – Visigoths, Huns, Franks, Lombards and Saracens who are said to have fortified the place, occupying it until 972 A.D. In settlement of a conflict with the Count of Provence, the fiefdom was given to Guichard de Villeneuve in 1387 and remained tied to the Villeneuve family until the French Revolution. From 1463 onwards, Tourrettes suffered a series of tumultuous periods including the black plague for 70 years, the Wars of Religion, the War between Austria and England (1744- 1748), the War of the Spanish Succession and the French Revolution. The Villeneuve family built the current chateau in 1437 encompassing the 12th century belfry, and occupied it until the French Revolution. The church of the same period (12th c.) was rebuilt in the 16th century and renovated in the 19th. During one of the wars that was fought in the area, the Chateau was transformed into a military hospital for troops fighting in the region. Eventually, it was passed on and owned by several families in succession, with no significant renovations being made for several generations. Finally, in the 1960s, in a great state of disrepair, the Chateau was bought by the state and renovated and the Town Hall and Mayor’s offices became the occupants. Today, the Town Hall hosts art exhibits and other cultural events for all to enjoy. The center of the village, whose Medieval and Romanesque architecture remains almost intact, is animated by a lively succession of artist studios, galleries, artisans, designers, weavers, potters, ceramic makers, painters, sculptors, jewelry creators… With fortified architectural qualities, the houses of Tourrettes sur loup form the ramparts of the village. The houses are situated around a semi-circular route that forms the central pathway through the village. Tourrettes-sur-Loup has a very small population of just over 2,400 residents. Inhabitants of the village are known as Tourrettans. The village was called «Tourrettes-lès-Vence» until the Revolution. In 1894 it was renamed «Tourrettes-sur-Loup» because of the river indicating the limit of the commune and in order not to be confused with «Tourrettes-Levens». The derivation of the name «Loup» comes from the fact that this valley was known to be filled with wolves. Tourrettes sur Loup, is known for it climate that is particularly favorable to the cultivation of the violet flower which became a true industry about 100 years ago. To this day, the cultivation of this delicate flower constitutes one of the principal activities and the importance of the production led to the village being named the “violet town”. One of our favorite and most popular houses in Tourrettes sur Loup, a perfect home away from home – and featured in the New York Times! Elegant, comfort, quality materials and breathtaking views. This is the perfect place to relax.